At AQ Bottled Water, we insist on the highest quality bottles for our waters. PET (polyethylene terephthalate) is our bottle of choice due to its lightweight consistency, shatter resistance and safety. Our stylish and distinctive glass bottles have designed to grace the table of any restaurant or boardroom. Available in still or sparkling water and in 3 sizes, we are confident we can quench any thirst with our premium range. 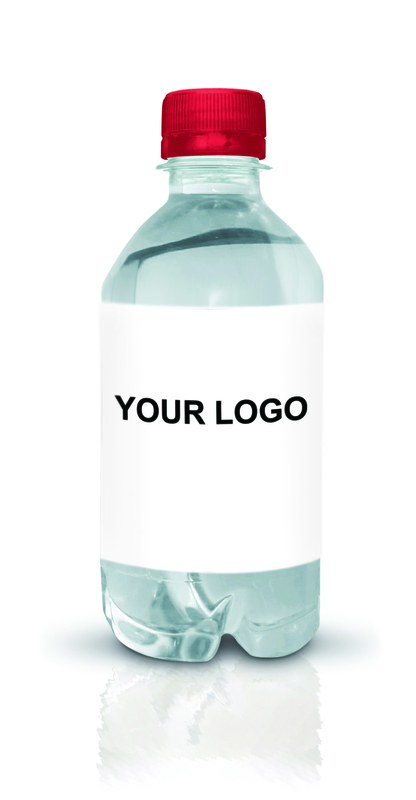 We think you’d be mad to miss out on advertising your own brand or event, but if you don’t fancy water with your own label on, why not try our premium branded water range? Whether you need still water or sparkling water, both readily available. The bottled spring water can be supplied in a variety of sizes and cap types. * All prices exclude VAT & Delivery. 17p is the contract price 500ml PET based on commitment for repeat business of 26 pallets over 12 months 1 pallet 500ml Spring water with screwcap 84 cases of 24 = 2016 bottles. Free design based on supplied mac compatible logo. Delivery based on a 3 day economy service to England & Wales, Scotland may incur additional costs. Please ensure you’re able to accept goods delivered “kerbside” on pallets, see FAQ for more details.